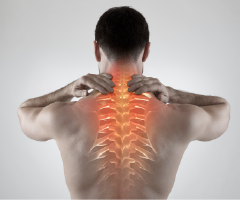 The neurosurgeons of NeuroScience & Spine Associates perform a very wide variety of head, neck and back related procedures to treat an array of symptoms and conditions. In our What We Do series we will discuss a sample of our most common procedures and conditions in greater detail so patients can gain more understanding of their ailments and the procedures we perform to try to resolve the issue. In this article we will discuss Anterior Cervical Discectomy & Fusion (ACDF). What is an Anterior Cervical Discectomy & Fusion? An Anterior Cervical Discectomy & Fusion (ACDF) procedure is a type of neck surgery performed to alleviate pain, numbness, weakness and tingling caused by spinal cord or nerve root compression as a result of a herniated disc or spinal canal narrowing. The procedure is performed on the cervical portion of the spine (the top) from an anterior approach (front). The procedure is done from the front (anterior) of the spine through the throat area. The surgeon approaches the spine between the neck muscles and the esophagus and trachea to expose the disc and vertebrae. The procedure is performed from the front as it provides better access to the disc. Once the surgeon gains access, the herniated disc is removed leaving empty space between the vertebra. A spacer (sometimes referred to as a cage) is inserted to prevent the vertebrae from rubbing together or collapsing. The vertebra and spacer are then fixed in place with a metal plate and screws. With the disc removed, there is no longer pressure on the nerves, which should alleviate the symptoms. Many times an ACDF is performed as an outpatient procedure and patients are up and walking the same day of surgery. Recovery times vary, typically 4-6 weeks. Follow-up visits will be scheduled to ensure that the procedure was successful and the hardware is in place properly. We perform a large portion of our ACDF procedure as our outpatient surgery center, The NeuroSpine Center. Learn more about Anterior Cervical Discectomy & Fusion by viewing our patient education video here.